Oh, our poor neglected garden. Between camping trips, soccer games, baseball games and life, we just haven’t had the time to dedicate to it this year. It looks nothing like our garden did at this time last year. Last year, it was a thing of beauty. All full and lush and green. With actual growing veggies, not weeds I mean. The thing is, it still ended up looking pretty much like it does now by the time the season was done. We really did dedicate a lot of time to it last year, but we just couldn’t keep up. We knew we’d have to do something different this year and maybe that’s why we’ve only planted just a few things so far. This year is a little bit of an experimenting year. 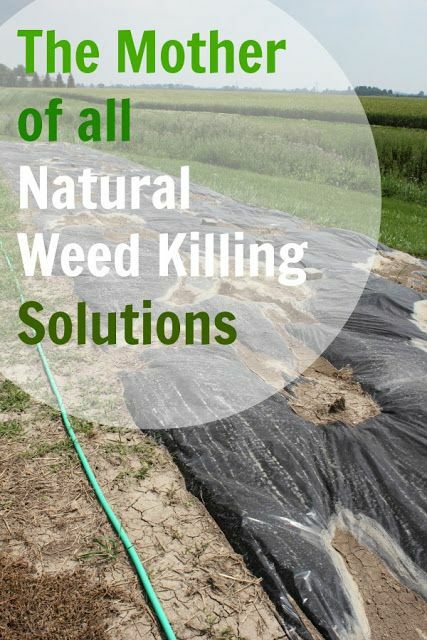 We’ve read several places that the best way (and the only way for some types) to get rid of weeds and keep them away without using crazy chemicals is to smother them with black plastic. For several years. 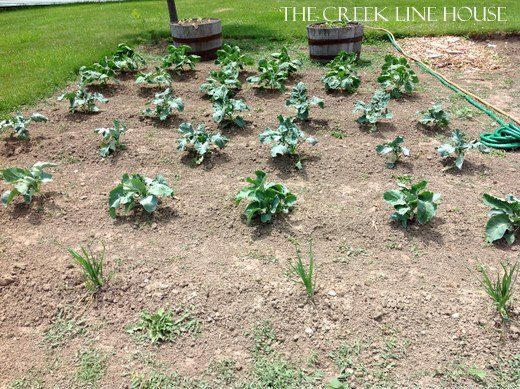 At the start of last year, it seemed like a pretty drastic measure to lose the use of your garden for a few years just to avoid pulling a few weeds, but by Spring of this year, we knew that was what we had to do. So about a month ago, we covered half of our garden with black plastic, leaving us just half of it to play with this year. It’s honestly still too big for any reasonable human beings to actually fill and keep up with, so we’re just fine with it for now. Getting the plastic was easy. Chris picked up a roll at the hardware store for about $50 and it’s big enough to last us until the end of time. Actually putting the plastic down in a way that will last and not allow any light in for the long haul was a little more challenging than it looks. We had to lay down the plastic and carefully dig a trench about 4 inches deep all around the edges, then bury the edges of the plastic. Somehow, wind was still getting underneath, so we used a combination of some patches of dirt on top and some rounded bricks (to prevent tearing) to hold it down. So far it seems to have done the trick! So why does it need to stay down for several years? I’ve actually read some suggestions that have said you only need to smother weeds for a few weeks. Well, we’re going to be leaving it down for 2-3 years. 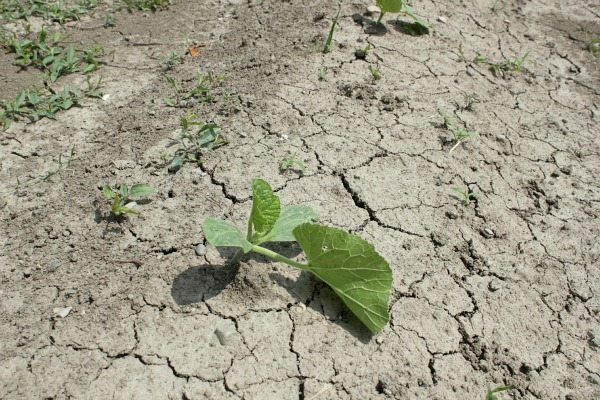 This is because the weeds need a chance to go through their life cycles and use up all the stored energy they have in their roots. And our weeds have some big roots. 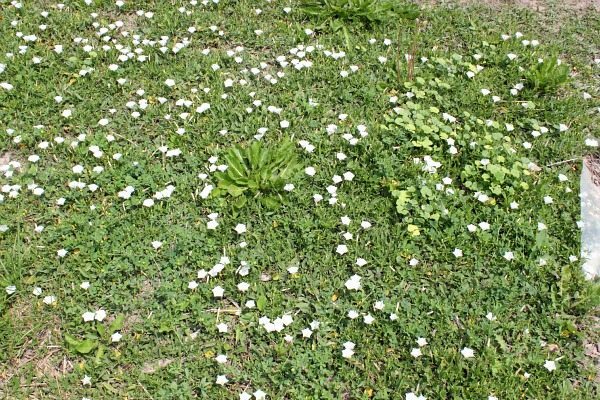 One type of weed that we have, I think it’s called Hedgewood Bindweed, is supposed to take about 8 months to use up all the energy it has stored, but the recommended smotheration time is about 3 years to be sure. So that’s the plan of attack. I’m feeling pretty good about it. Meanwhile, we’re still having a heck of a time keeping up with the weeds in the other half. For the record, even with all of my weed killing strategies this year, I’m still kind of a wild flower/weed lover at heart. I’m a little bit tempted to one day just let the whole property go au naturel and see what happens. Look at these pretty pinky flowers that popped up! OK, we do have some actual veggies growing this year, but only very few so far. One success is the pumpkins. Last year by this time, I’d already replanted them thrice because of the bugs that were eating them to the ground. This year, one shot and it looks like we’re good to go..er..grow! That extra thick weedy patch down the center is where we’re going to put the path. More black plastic covered with some mulch is the plan! 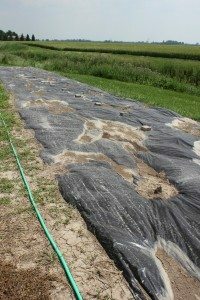 Edit: I should clarify that after those 2-3 years, the black plastic is coming off to hopefully reveal lots of sad and smothered weeds…and great soil! We’re not just going to plant over top like they do with that landscaping fabric. Been there, doesn’t work. Judging by how well the plasticky side of our garden seems to be doing in the weed department, I’m a little tempted to create plastic paths down the centers of all of our rows in the future just to prevent having to weed so much. I won’t, because that would be even weirder than having a plastic half-garden. But, I could! And it would work! 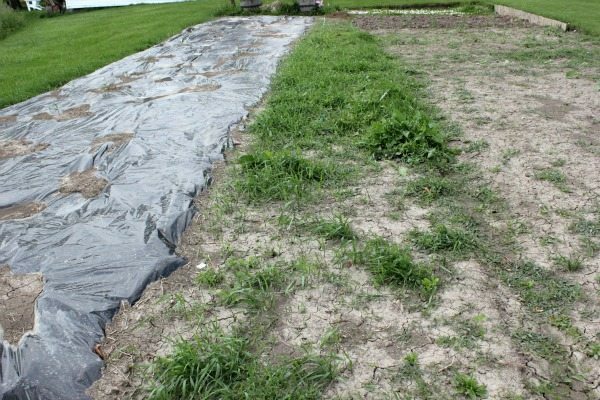 I hate to be the bearer of bad news, but the previous owner of my house pretty much shrink wrapped the entire 3 acres in black plastic, and the weeds just grow in top of it in the topsoil!! Boooooo. Down with the weeds. Bindweeds are the bain of my existence! Every spring, my flower beds rock, and now,in June, they are a freaking trainwreck of smothered flowers. 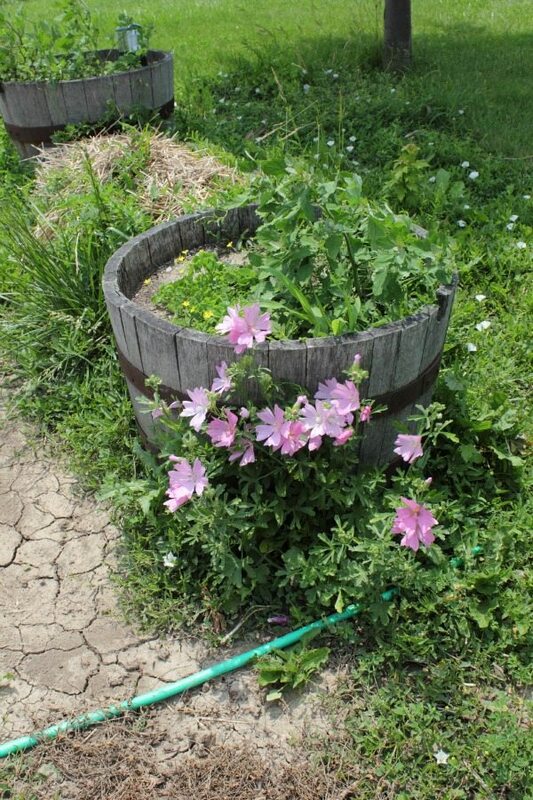 The bindweed is choking everything out…and I’ve been told that if you pull it, it makes the root system stronger or something. The worst! See this blog for the salt, vinegar, and washing up liquid recipe. The writer says it works well on bindweed. As I loathe Bindweed, and cuss at it as i pull it off my plants I’ve been desperate to try something that would actually work. I have dogs so won’t use poisons. Beth, I believe it! As long as they don’t grow underneath I’m fine with it. The plastic is coming off in a couple of years and hopefully everything underneath is good and smothered… or at least weakened to the point of not driving me so crazy! I hope this works for you. Aaaargh weeds are driving me CRAZY this year too and after pulling weeds two weeks ago I ended up with poison ivy that still isn’t completely healed. And still many more weeds to kill. It never ends!! Sounds to me like your solution should work. That’s why I did a small raised bed this year, so much easier for me to control the weeds!!! It’ll be interesting to see how it works, we have never lived someplace 3 years in a row so I’ve never considered such a time invested solution! As far as I’m aware, newspaper is the best way to kill weeds, grass and etc. I have a friend that has used it for years to create garden spaces in her lawn. Just choose the spot, place the newspaper down in multiple layers(not just open and lay it down, but rather separate the layers and lay them down) in the shape you want the garden. Dampen it, and try to keep it wet. She puts tires and rocks on it to keep it down. After about a year of this she just moves the objects keeping it down, and plants and mulches on top. No weeds, no grass and it is biodegradable. I am doing it this year in my front garden and so far so good. I hate plastic because it is a pain, and from the people I’ve talked to, it only works for a while, where newspaper works longer. Kris, I actually do the newspaper thing on my smaller flower gardens and I love it! The only difference is that I just mulch right over the newspaper so you’d never know it’s there! Unfortunately, with our crazy climate here, even multiple thick layers of newspaper only last about 6 months, so I need to add another layer then. This is a biiig garden though and needs a biiiig solution. The black plastic (must be black!) is what all the real professional gardeners seem to recommend. I use newspaper in my garden followed by grass clippings no weeds!!! I’ve been trying that the last few years too. Unfortunately, these country weeds we have just bust right through, even if I do the newspapers 10 pages thick! Arg! So frustrating! I not only get weeds but I get little trees that sprout from squirrels burying the nuts. Ugh. Definitely pinning this for you! Ugh, I hear ya on the weeds! It is not (thankfully!) something I have to deal with right now while we’re in our small apartment, but growing up in Northern CA we had blackberries growing wild all over our backyard! It was awesome for my brother and I as kids cuz we could eat all the blackberries we wanted all the time, but if we ever tried to actually control the plants in the backyard it was just impossible! 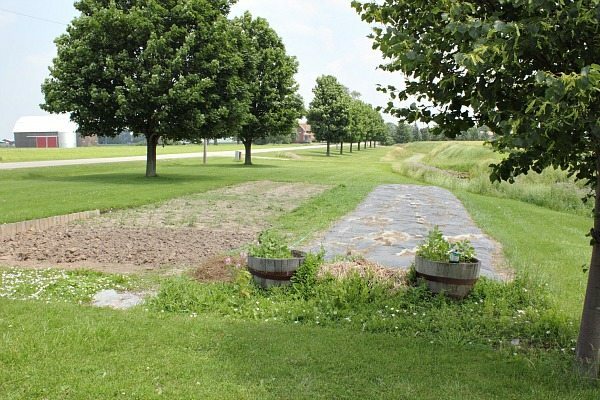 Grrr…weeds stink! You certainly are the queen of solutions, hope this works for you girl! We don’t have a huge yard, but it seems the weeds have still managed to find us!! The husband is in charge of that territory, so I’ll have to share your advice! I love seeing post of your property. It’s so beautiful! Except for a few random tomatoes and my experimental sunchoke plant, our garden is pitiful this year. I blame the bees and the attention they pull! Wow! What an awesomely large garden – but I’m sure it takes an inhuman amount of work to keep up! I just have a small garden area, but trying to maintain it is tough, so I did something similar-ish. I had leftover black landscaping fabric and rolled it down in the garden, then cut holes in it to put my plants in. I’m hoping it helps keep the moisture in and the weeds out! This year after we got most of the big weeds out, we covered the entire garden with a thick layer of newspapers. (My hubby works for a newspaper so I have an unlimited supply.) Then we covered with a thick layer of straw. The only weeds I’ve had to worry about all summer have been the ones growing right next to the plants. And those have been easy to keep pulled. Once the garden is done we are going to pull up all the dead plants and then till the newspapers and straw and hopefully a big load of manure or two as well. Hope your garden is going well for you! Well it’s now 2015, Has it worked?!? I need to do an update post I think! The weeds basically ended up growing under the plastic and some even poked through! We did another year with fresh plastic and then this year we’ve done plastic first, then that thick paper house wrap on top, then a thick layer of mulch and we seem to be starting to make some progress! The weeds here are STRONG!! Bought our house in VA last yr and I got a 1/4 acre section on the property that is overgrown with bamboo, poison ivy, ivy, thorns and weeds. Want to obviously use this space but just as an open area with mulch, no plants, got more than enough in the rest of the property. Spent the last month clearing it all out and not wanting to do it again wanted to hear how this worked out for you? Was going to go the landscaping tarp route but I priced it out and its going to run me about a $1K when all is said in done. What was the thickness of the plastic you used? 2 Mil? Your way with the plastic would be a lot cheaper, but not if its a waste of time. Any and all suggestions are welcome. Hi Matt! We’ve had a bit of success with this but it’s taken a few applications because we have some really strong weeds. Some of our thistles just break right through the plastic and even after having the area covered for a couple of years now, we do still have a few things growing through. So I’d say it really depends on how strong your weeds are! The latest thing we’ve done on just a small section is plastic, then that thick paper house wrap, and then a thick layer of mulch. This seems to be working pretty well, but again, it’s not perfect! Hi there 🙂 I understand the idea of baking the weeds and starving the roots, however I found better solution for that matter also now I don’t have some many weeds as before plus my soil is lovely and watering is not a problem anymore. The solution? Cardboard! easy, free and I have plenty of vegetables! I hear that laying down old carpet will prevent weeds from growing….here in the Midwest some landscapers suggested this I have some around my pool and am pkanning on “slipping ” some under my fence lines it appears to work, it is free, and the wind does move it!